Rhythmbox, the pre-installed music playing application, now reaches the 3.4 release with new plugin, many improvements, bug fixes and translation updates. Rhythmbox 3.4 brings the new web remote control plugin that sets up a web server via Python 3, allows users to control music playback remotely in a web browser. A key can be setup in Preferences for authentication purpose. There are also some fixes to Party Mode status, TerraParser (lyric’s plugin), cover art, MP4 encoder settings, memory leak, and more. See more details in the NEWS file of project page. 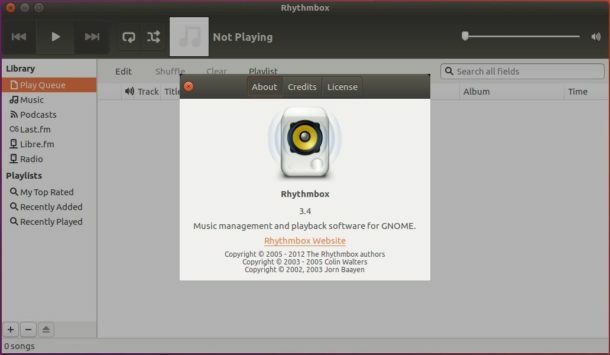 Besides building from source, Rhythmbox 3.4 has been made into the main archive for Ubuntu 16.10 Yakkety, for daily build users just run Software Updater to upgrade the software. For Ubuntu 16.04, a third-party PPA (check the link before adding the PPA) is maintaining the most recent packages, but NOT UPDATED at the moment. Once the PPA is updated with the 3.4 binaries, add it via the command (Ctrl+Alt+T) below, and finally upgrade Rhythmbox via Software Updater utility.